These are pics of my grandmother with her colleagues outside the laundry she worked at in Conway Place. The coach is parked outside St Barnabus Church Hall. In the James Gray photograph, the coach stood where the white car is parked. The road layout has been changed since, but the church hall was opposite the church as Conway Place started outside St Barnabus where it joined Clarendon Road. 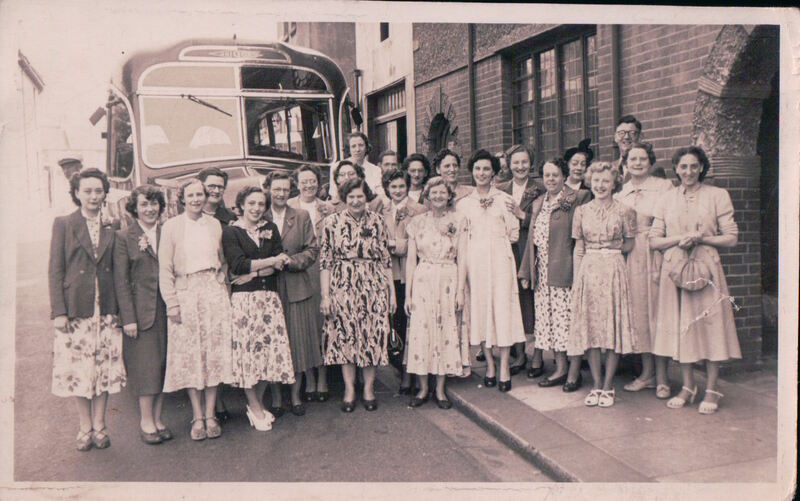 I also have a picture inside St Barnabas Hall of a street party from around 1954/55 time. I think I was around ten at the time. We lived in Princep Road off Sackville Road. I came across this accidently but knew my grandmother Bet Ratley worked in the laundry around that time and she is in the photo – fourth from the left. I don’t know any of the other people but it was great to see this old photo. Jenny Bainbridge – are you related to Freddie Bleach? He was a great spinner (of the wool and spindle!). He visited us in Melbourne, Australia in the late 1970s.